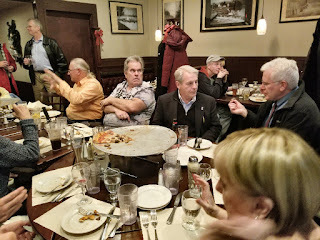 Sen. Len Suzio (center) listens to a taxpayer during his Dec. 5 “Pizza and Politics” event at Avanti Restaurant in Meriden. A large crowd came out to talk about public policy issues in a casual setting. Suzio was recently named State Senator of the Year by the Motor Transportation Association of Connecticut for leading the successful fight to stop the Malloy Administration’s controversial 'Mileage Tax' proposal. Those who couldn't make it can contact Suzio at Len.Suzio@cga.ct.gov or 800-842-1421. Suzio (www.SenatorSuzio.com) represents Cheshire, Meriden, Middlefield, Middletown and Rockfall.